Well, if you read our last post your'll know I was a little concerned about how my sour dough bread would turn out - especially as it had been an all day job to make it! 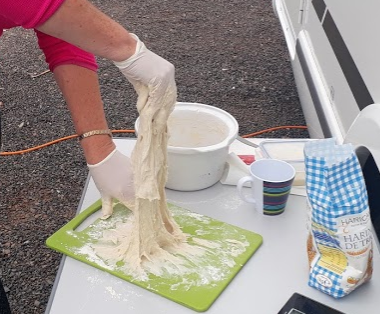 I'd started around 10am by mixing together flour and water to autolyse and that had to be left for an hour. Then came the fun hard messy bit where it had to be kneaded, and I think in the end I'd got more stick stuck to me than I eventually managed to get in the tin! And after that the bread had be be stretched x3 and then left to rise - a process that took several more hours due to the mixture's lack of traditional yeast! I eventually got around to cooking it at about 11pm on Saturday night - but all things considered, I was quite pleased with the result! It was a bit crusty but we scoffed it for both breakfast and our picnic lunch and neither of us seemed to suffer any ill effect, so eventually I might pluck up courage to have another go! Anyway, I've digressed - I'm supposed to be telling you about Sunday! Today we saddled up and headed out towards Burriana where we'd been told there was a big beach market - and there was but when we got there we couldn't visit because we'd forgotten our bike locks - I'm not sure if that was accidentally on purpose or not, but from a distance the things for sale mostly looked like tat so I don't think we missed much! So instead of spending time and money at the market we proceeded on a bit further and found a lovely spot on a deserted beach where we indulged in a coffee break, and later another lovely spot where we picnicked! Our 32 mile ride then brought us back through more miles of orange groves to complete a circle, and when we got home we partook of a nice cool beer in the late afternoon warm sunshine - another blissful day. Today was the day we were going on the site's planned coach trip to Valencia, and even though we had about 6 hours in the city it would have been impossible to fit everything it had to offer in - but we did try! And rather than waffle on to much I'll let our pictures tell the story! 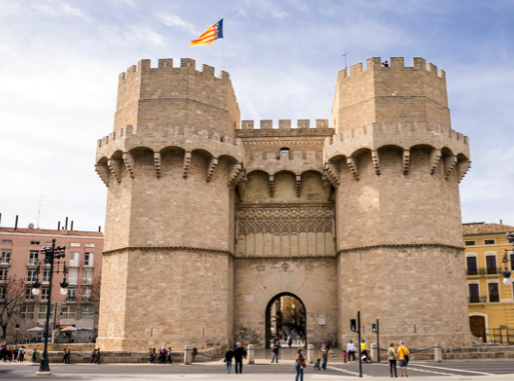 We were dropped off at the Torres de Serrano - The very well preserved historical northern entrance to the medieval city of Valencia. Apparently it's one of the twelve gates that formed part of the ancient city wall and it was built at the end of the 14th century. And from there it was straight into the Cathedral Square for an essential coffee top up - and as you would expect, here we found the Metropolitan Cathedral - 'Basilica of the Assumption of Our Lady of Valencia', and also what one of our fellow travellers called 'The Floozy in the Jacuzzi'! The square also provided views of The Micalet - another 14th century building that was constructed on an octagonal base and with eight picture windows that display the bells hall! The tower's name - El Miguelete - comes from the name of it's biggest bell - Miguel - which was cast in 1532 and weighs more than ten tons. Inside there is a spiral staircase that can be climbed, but unfortunately at the time of our visit it seemed to be closed! Once refreshments had been supped we headed off to explore Valencia's massive indoor market. Here we found a heady mixture of sights, smells and sounds, along with all manner of edible and non edible consumables, and it was quite easy to obtain the main items on my shopping list which were mainly herbs and spices! However, so much more of the produce looked so inviting that I was quite sorry that I couldn't do my weeks shopping, but we did feel compelled by buy a few of the massive strawberries to snack on! 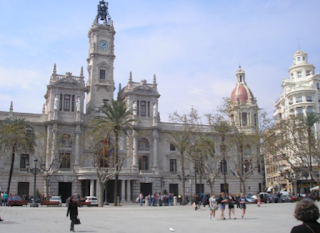 Next came the Estacio del Nord and The Plaza de Toros de Valencia - which translates to The North Train Station and the city's Bullring, and nearby we also found the Town Hall and another lovely building that I couldn't identify! And that really was only a few of the places on our tour, but by 1 ish we were ready for another rest so we consulted Google about a good place to eat and we were advised to go to St Thomaso - an Italian restaurant that was just a bit off the beaten track! There we were treated to pizza and the biggest calzone I think I've ever seen - it would easily have fed both of us and I was well and truly defeated by it - but I made a very valiant effort! After that we we toured a bit more and visited the city's Botanical Garden's which were first established back in 1567 and where we found an oasis with many medicinal plants, cacti and palms - and that provided a perfect place to sit and enjoy our after dinner coffee! Next we took advantage of the Turia Gardens - one of the largest urban parks in Spain. 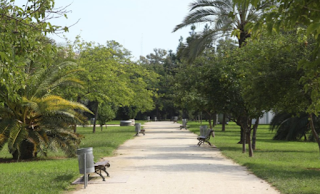 It bisects the city for nine kilometres and passes through the bed of the River Turia whose course was diverted after a devastating flood on 14th October 1957. All in all, for saying we're not really very keen on city's we had a lovely day, and to round it off we treated ourselves to Italian ice cream on the way back to the bus! However, 7 hours was quite long enough and I don't really expect we'll be repeating the experience any time soon! After yesterday's exertions today was always destined to be a more restful one, and this was reinforced because John was playing host to another cold so he was feeling slightly under par - this is his second within a month so I think I'll have to scrump a few more oranges to top up his Vitamin C! Therefore, we passed our day with a bit of essential shopping and then a gentle bike ride along what has fast become one of our favourite bits of coast. It's just 10 miles there and back and there are plenty of benches at the other end where we can sit and sip our coffee while watching the very pretty coast line with it's wafting palms! 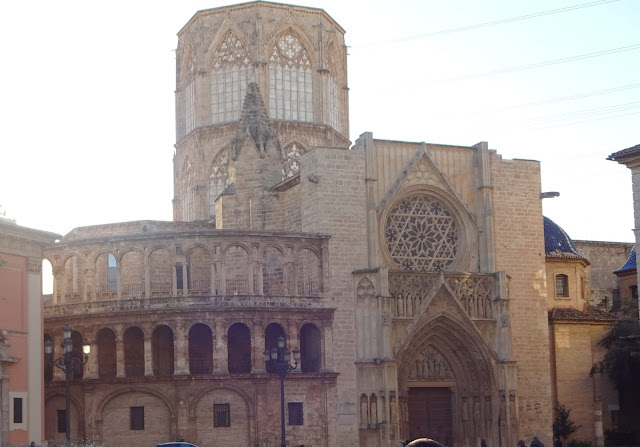 This morning John was feeling much better - and it was a good job too because today we'd arranged a 32 mile bike ride with a couple of our fellow campers (Jack and Liz) to the town of Sagunto to visit the Via del Portic museum and the Fortress that stands high above the town. 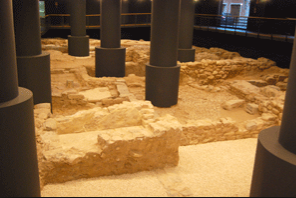 The Via del Portic is an Archaeological Heritage Site and it's contents date back to the Roman Imperial period of the 2nd Century, but what makes it more unusual is that it is underneath a modern day apartment block. 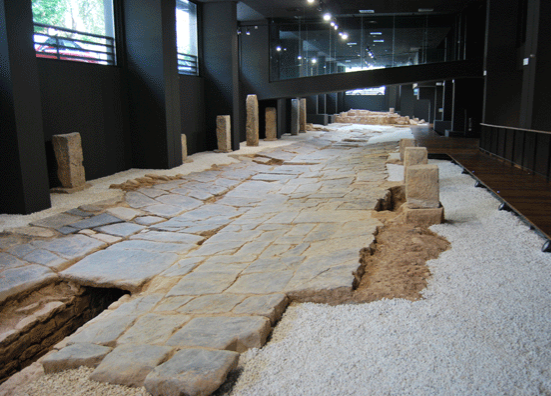 The site displays Roman houses, roads, sewers and religious buildings that have been preserved because the several story high building above it stands on stilts. 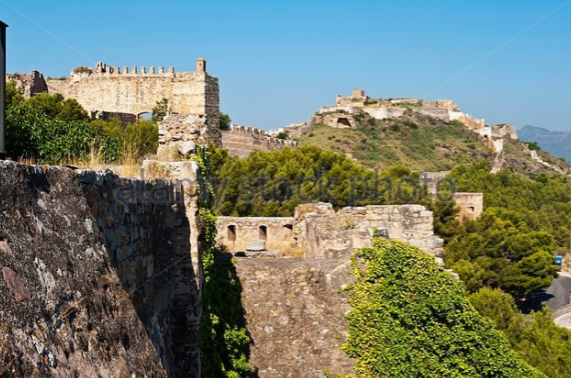 And when we'd finished exploring that very interesting piece of history we indulged in a bit more exercise by climbing up what felt like hundreds of steep rugged steps to the Fortress that overlooks Sagunto town. The castle covers an area of almost one kilometre in length and can trace it's history back for over two thousand years. In it's time it has seen the presence of different civilisations that included Romans, Visigoths, Arabs and Christians, and since 1931 it has been a National Monument. 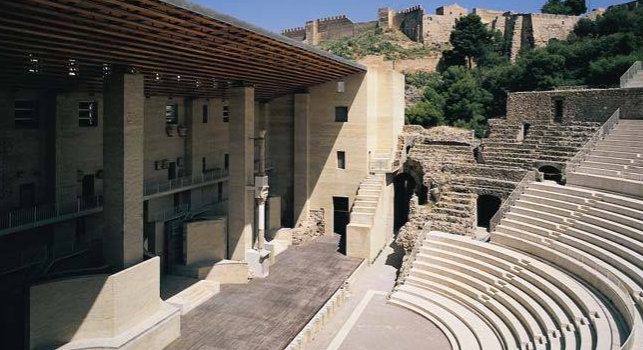 And if all that history wasn't enough we also had the pleasure of visiting the Teatro Romano de Sagunto - the remains of a Roman Amphitheatre that have been restored for the presentation of modern day productions. Apparently it was built in the middle of the first century using the slope of the mountain, and in it's time it could seat 8,000 spectators - and even with today's modernisation, if you closed your eyes you could almost hear the lions roar! Then later when we'd peddled all the way home and thought we could just put our feet up for the evening we were invited to a BRANDY party -' a what' you might say! Well, if you've been keeping up you might recall the Chinese Auction of Christmas Day. There, another couple - Julie and Ian - had managed to 'steal' a bottle of brandy that had been in both mine and Liz's possession, but rather that sup it all themselves they invited us along to assist them! And a very jovial and well oiled evening was had by all!! Thursday is always Tapas day here on the Monmar Campsite, so as we didn't go last week we decided to make the effort and produce something nice for today's occasion! I decided on ham and blue cheese mini quiches and lemon drizzle cake! However, although the quiches turned out well the same couldn't quite be said for the cake! I think I really should have baked it yesterday but the Brandy seemed much more important at the time! Therefore, when I tried to slice it I found it to be extremely crumbly and more than a tad sticky - but despite that, even if I do say so myself, it was very yummy😋😋😋. But how could I serve it as finger food? In the end I divided it into little fragile sticky potions and popped them into muffin cases - and every crumb disappeared!